ناطقی رستمی, محمود, تسبیحی, مینو, قربانیان, پروانه, نجفی, زینب, موسوی میاندشتی, زهرا. (1396). وضعیت اپیدمیولوژیک هپاتیت‌های ویرال در بیماران مراجعه‌کننده به مراکز بهداشتی استان قم در سال‌های 1388 تا 1392. سلامت جامعه, 10(1), 19-28. محمود ناطقی رستمی; مینو تسبیحی; پروانه قربانیان; زینب نجفی; زهرا موسوی میاندشتی. "وضعیت اپیدمیولوژیک هپاتیت‌های ویرال در بیماران مراجعه‌کننده به مراکز بهداشتی استان قم در سال‌های 1388 تا 1392". سلامت جامعه, 10, 1, 1396, 19-28. ناطقی رستمی, محمود, تسبیحی, مینو, قربانیان, پروانه, نجفی, زینب, موسوی میاندشتی, زهرا. (1396). 'وضعیت اپیدمیولوژیک هپاتیت‌های ویرال در بیماران مراجعه‌کننده به مراکز بهداشتی استان قم در سال‌های 1388 تا 1392', سلامت جامعه, 10(1), pp. 19-28. 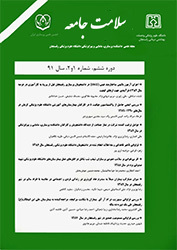 ناطقی رستمی, محمود, تسبیحی, مینو, قربانیان, پروانه, نجفی, زینب, موسوی میاندشتی, زهرا. وضعیت اپیدمیولوژیک هپاتیت‌های ویرال در بیماران مراجعه‌کننده به مراکز بهداشتی استان قم در سال‌های 1388 تا 1392. سلامت جامعه, 1396; 10(1): 19-28. 1دکتری تخصصی، گروه میکروبیولوژی و ایمونولوژی، دانشکده پزشکی، دانشگاه علوم پزشکی قم، قم، ایران. مقدمه: استان قم به علت حضور مهاجرین، عبور مسافرین و اسکان زائرین اهمیت ویژه‌ای از جنبه اپیدمیولوژی بیماری‌های عفونی دارد. این مطالعه به بررسی وضعیت هپاتیت‌های ویروسی در بیماران مراجعه‌کننده به مراکز بهداشتی استان قم در سال‌های 1388 تا 1392 می‌پردازد. مواد و روش‌ها: در این مطالعه که به‌صورت مقطعی و توصیفی- تحلیلی انجام شده است، بیماران مبتلا به هپاتیت مراجعه‌کننده به مراکز مختلف بهداشت در سطح استان قم در سال‌های 1388 تا 1392 به صورت سرشماری مورد معاینه بالینی قرار گرفته و نمونه خون از آن‌ها گرفته شد. اطلاعات دموگرافیک، بالینی و آزمایشگاهی ثبت شده و با آزمون‌های آماری مجذور کای و فیشر مورد تجزیه و تحلیل قرار گرفت. یافته‌ها: در دوره مورد بررسی 1188 مورد هپاتیت در مراکز بهداشت استان قم ثبت شده است. میانگین سن افراد مورد بررسی 17± 6/48 سال بوده است. در مجموع مواردی که آزمایش خون انجام شده بود تعداد 836 مورد HBs Ag، تعداد 325 مورد HCV Ab و تعداد 27 مورد HIV Ab مثبت بودند. درد فوقانی شکم، زردی و تهوع شایع‌ترین علائم گزارش شده بودند. سابقه تماس غیرجنسی (046/0=p) و مداخله دندان‌پزشکی (050/0=p) در افراد HBs Ag مثبت به‌طور معنی‌داری بیش از افراد HBs Ag منفی و سابقه زندان، خالکوبی و تزریق مواد در افراد HCV Ab مثبت به‌طور معنی‌داری بیش از افراد HCV Ab منفی بود (001/0p<). نتیجه‌گیری: آموزش مداوم افراد بومی و مهاجرین استان برای مراجعه، تشخیص و درمان به‌موقع، به‌ویژه در رابطه با گروه‌های پرخطر نظیر افراد با تماس پرخطر و معتادان تزریقی اهمیت بسزایی در کنترل عفونت هپاتیت دارد. Introduction: Because of the huge number of travelers, immigrants and pilgrims, Qom Province has a priority in evaluation of infectious diseases epidemiology. This study reports the epidemic aspects of viral hepatitises in patients referred to health care centers of Qom Province during 2009-2013. Materials and methods: In this cross-sectional and descriptive-analytical study, hepatitis patients referred to health care centers of Qom Province during 2009-1013 were examined and blood samples were collected. Demographic, clinical and laboratory data were recorded in special questionnaire and analysed by using Chi-square and Fisher exact tests. Results: A total of 1188 cases (64.0% male, 36.0% female) of hepatitis were recorded in health care centers of the Province. The mean±SD age of the patients was 48.6±17.0 year. Among all patients which have laboratory findings, 836 were HBs Ag positive, 325 HCV Ab positive and 27 HIV Ab positive. Abdominal pain, jaundice and nausea were the most common symptoms. In analysis of risk factors of infection, non-sexual contacts (p=0.046) and dentistry intervention (p=0.050) were significantly higher in HBs Ag positive compared to HBs Ag negative patients. Also, imprisonment, skin tattoos and intravenous drug abuse were significantly higher in HCV Ab positive compared to HCV Ab negative patients (all p<0.001). Conclusion: Continued education of the public including natives and immigrants for early referral, diagnosis and management of the infection especially in high risk population such as drug abusers and those with non-safe contacts play an important part in control of hepatitis infection. MacLachlan JH, Cowie BC. Hepatitis B virus epidemiology. Cold Spring Harbor perspectives in medicine 2015;5(5):1-5. World Health Organization. Introduction of hepatitis B vaccine in to child hood immunization services. 1nd ed (update 2014). Geneva: WHO publication; 2001: 1-55. Azizi F. Epidemiology and control of prevalent diseases in Iran. 3ed ed. Tehran: Khosravi publication; 1390: 852-86. Trépo C, Chan HL, Lok A. Hepatitis B virus infection. The Lancet 2014;384(9959):2053-63. Zidan A, Scheuerlein H, Schüle S, Settmacher U, Rauchfuss F. Epidemiological pattern of hepatitis B and hepatitis C as etiological agents for hepatocellular carcinoma in Iran and worldwide. Hepatitis Monthly 2012;12(10 HCC):6894-8. Alavian SM, Hajarizadeh B, Ahmadzad-Asl M, Kabir A, Bagheri-Lankarani K. Hepatitis B Virus infection in Iran: A systematic review. Hepatitis Monthly 2008;8(4):281-94. Kyu HH, Pinho C, Wagner JA, Brown JC, Bertozzi-Villa A, Charlson FJ, et al. Global and national burden of diseases and injuries among children and adolescents between 1990 and 2013: findings from the global burden of disease 2013 study. JAMA Pediatrics 2016;170(3):267-87. Alavian S-M, Keyvani H, Rezaei M, Ashayeri N, Sadeghi HM. Preliminary report of hepatitis B virus genotype prevalence in Iran. World Journal of Gastroenterology 2006;12(32):5211-3. Keshvari M, Sharafi H, Alavian SM, Mehrabadi H, Zolfaghari S. Prevalence and trends of transfusion-transmitted infections among blood donors in Tehran, Iran from 2008 to 2013. Transfusion and Apheresis Science 2015;53(1):38-47. Nokhodian Z, Adibi P, Ataei B. Prevalence of Hepatitis B Virus Infection in Isfahan Province. International Journal of Preventive Medicine 2014;5(Suppl 3):S193-9. Brown RS, Gaglio PJ. Scope of worldwide hepatitis C problem. Liver Transplantation 2003;9(11):10-3. Nelson PK, Mathers BM, Cowie B, Hagan H, Des Jarlais D, Horyniak D, et al. Global epidemiology of hepatitis B and hepatitis C in people who inject drugs: results of systematic reviews. The Lancet 2011;378(9791):571-83. Taherkhani R, Farshadpour F. Epidemiology of hepatitis C virus in Iran. World Journal of Gastroenterology 2015;21(38):10790-810. Qom Province public affairs office. Province official page. [cited 28.08.2015]. Available from: http://www.ostan-qom.ir/index.aspx?siteid=1&pageid=830. Salemi M, Sanei E, Moradi A, Khosravi S. Prevalence of HCV infection in thalassemia major in Zahedan. 8th Iranian congress of Tropical and Infectious Diseases; 1998 Nov 2-5; Tehran, Iran. 1998:85. Samar G, Yalda A, Amini S. Prevalence of HCV infection in β-thalassemia major in two educational centers. 5th Iranian congress of Tropical and Infectious Diseases; 1995 Nov 2-5; Tehran, Iran. 1995:124. Alavian SM, Einollahi B, Hajarizadeh B, Bakhtiari S, Nafar M, Ahrabi S. Prevalence of hepatitis C virus infection and related risk factors among Iranian haemodialysis patients. Nephrology 2003;8(5):256-60. Trepka MJ, Weisbord JS, Zhang G, Brewer T. Hepatitis B virus infection risk factors and immunity among sexually transmitted disease clinic clients. Sexually Transmitted Diseases 2003;30(12):914-8. Ghanaat J, Sadeghian A, Ghazvini K, Nassiri MR. Prevalence and risk factors for hepatitis B virus infections among STD patients in northeast region of Iran. Medical Science Monitor 2003;9(2):CR91-CR4. Alavian S, Mostajabi P, Malekzadeh R, Azimi K, Vosoogh H, Sarrafi M, et al. Evaluation of hepatitis B transmission risk factors in Tehran blood donors. Govaresh 2012;9(3):169-75. Alizadeh AHM, Alavian SM, Jafari K, Yazdi N. Prevalence of hepatitis C virus infection and its related risk factors in drug abuser prisoners in Hamedan-Iran. World Journal of Gastroenterology 2005;11(26):4085-9. Poorolajal J, Mirzaei M, Bathaei SJ, Majzoobi MM. Hepatitis B and C infections in hamadan province during 2004-2009. Journal of Research in Health Sciences 2011;11(1):51-7. Sharif M, Sherif A, Sayyah M. Frequency of HBV, HCV and HIV infections among hospitalized injecting drug users in Kashan. Indian Journal of Sexually Transmitted Diseases and AIDS 2009;30(1):28-30. Zali M, Mohammad K, Noorbala A, Noorimayer B, Shahraz S. Rate of hepatitis B seropositivity following mass vaccination in the Islamic Republic of Iran. Eastern Mediterrnean Health Journal 2005;11(1-2):62-7. Momen-Heravi M, Akbari H. Persistance of HBsAg and serum activities of liver enzymes among chronic carriers of hepatitis B. Zahedan Journal of Research in Medical Sciences 2011;13(3):35-40.